Wow, this is gorgeous Pat. What a great image you chose to use in your triptych design. Love it! Love this, Pat! The colors are just perfect! Beautiful card, love love love this image and the soft colours are really pretty. 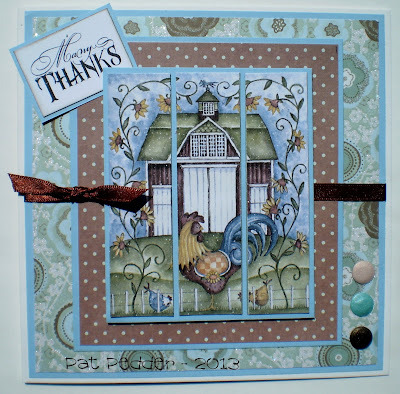 Fab card Pat - I love the colours and the image. This has to be one of my all time favorites that you have made Pat. What a great idea and I am going to have to give it a go. I am a country girl and this says country in a wonderful way! I do love this card!!!! I think I might have told you that before but sometimes my memory isn't what it should be!